You might have heard the common terms multimedia and hypermedia in the context of a computer, electronic devices and the internet. The main difference between these terms is that the multimedia involves the various ways of representing the electronic document such as image, audio, graphics, video, etcetera over the electronic devices using any network medium. On the contrary, the hypermedia is the collection of multimedia placed linked over the internet in a non-linear way, or we can say that this is a non-linear form of data representation. Basic Involves the multiple forms of representing information. Non-linear linking of multimedia. Hardware requirement Needs multimedia delivery systems Enhance the ability by providing clickable links. Multimedia can be defined as any form of representation for the information through various electronic means and internet. It involves a group of text, graphics art, video, audio, animation sent to the users of computers, mobile phones, pager, fax or other electronic devices. The integration of the sensual elements of multimedia such as fascinating pictures and animations, captivating video clips, engaging sounds, and textual information can excite or motivate the thought and action process of people’s brains. So the devolution of the interactive control to the process makes it more interesting. Similarly, HTML, XML, SMIL derives elements that describe generic document structure and formatting for publishing hypermedia. There are several software tools available for multimedia such as digital video editing, electronic newspaper, production system, video on demand interactive TV. Cool edit, sound edit and pro tools for digital audio. Adobe Illustrator, adobe photoshop, Macromedia fireworks for graphics and image editing. Adobe Premiere, final cut pro for video editing. Similar to multimedia, the hypermedia is just the provided framework of the linked which facilitates the user in the navigating the interactive multimedia. Hypermedia is a nonlinear system it is derived from the hypertext and works in the same way as hypertext. In hypertext system, the text links are followed that are aiming to other parts of the document or other documents for reaching the various part of the document. 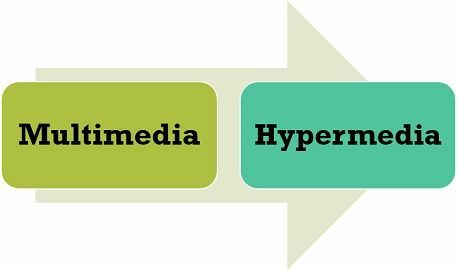 In a similar manner, hypermedia not only involves texts but also other types of media like images, audio, video, graphics and so on. WWW (World Wide Web) plays a significant role in hypermedia application because it provides an enormous amount of information through the web servers which is easily posted and navigated with a web browser. HTTP is the primary protocol used to transfer hypermedia along with this, different file types are also supported. The steps followed to generate hypermedia documents are: Information generation or capturing, authoring, publication. Multimedia is a combination of the media and content where the information is presented in some form across the devices. On the other hand, hypermedia is more contrasting in nature and used in non-linear data representation. The multimedia needs delivery hardware facilitating audio, video and display output. As against, the hypermedia enhances the capabilities of multimedia by generating clickable links on web browsers to access media. There are fundamentally two forms of multimedia linear and non-linear whereas hypermedia is associated with a non-linear description of interactive multimedia information that is usually linked to other content through clickable links. Multimedia works on basis of integration and interactivity while in hypermedia the main components are interconnectivity and cross-referencing. Multimedia is a group of external rendition of the data and information using various forms of coding whereas hypermedia is kind of application of multimedia, where the multimedia elements are linked using the hyperlinks over the internet.